Getting to big for the dollhouse, Alice? I saw this photo by itself without the rest of the editorial and thought it was fantastic. Then I found that this picture of Natalia Vodianova is part of a larger editorial featured in Vogue,June 2003. Obviously, it was by my favourite photographer Annie Leibovitz. I wonder why I haven’t come across it sooner. Natalia is Alice. 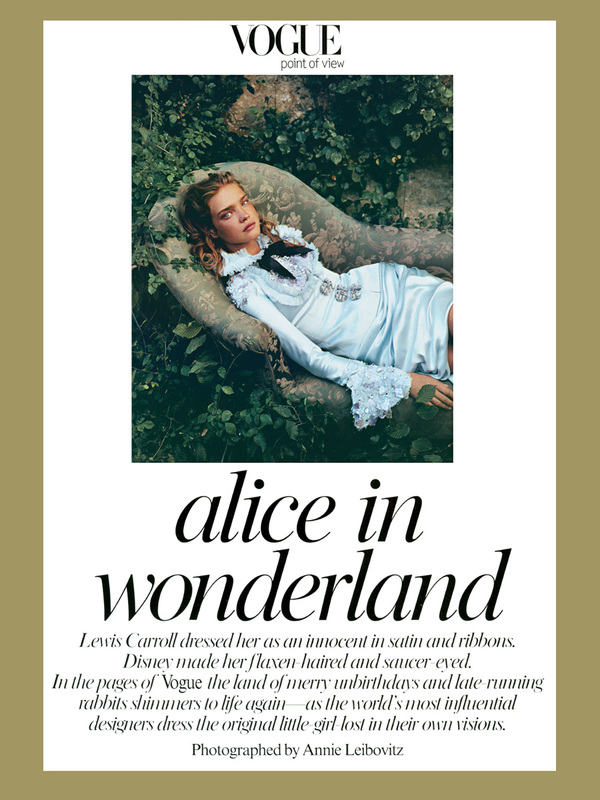 Marc Jacobs, Karl Lagerfeld, Tom Ford, Donnatella Versace, Olivier Theyskens, Jean-Paul Gaultier, Viktor & Rolf and John Galliano all portray characters in Lewis Carroll’s fanciful novel. Vodianova wears the clothes of each designer she shares the picture with. It is so beautifully done. This entry was posted in Art, Fashion and tagged Annie Leibovitz, Donnatella Versace, Editorial, Fashion, Jean Paul Gaultier, John Gallion, Karl Lagerfel, Lewis Carroll, Marc Jacobs, Natalia Vodianova, Olivier Theyskens, Tom Ford, Viktor & Rolf, Vogue. Bookmark the permalink. 6 Responses to Getting to big for the dollhouse, Alice? This is definitely one of my favorite shot ever. I just love Alice in wonderland and I think they couldn’t have chosen a better model to portray her. Natalia + Lewis Carroll + Galliano + Dior + Annie= SUBLIME.